Imagine if a fast court Slam were played in France? 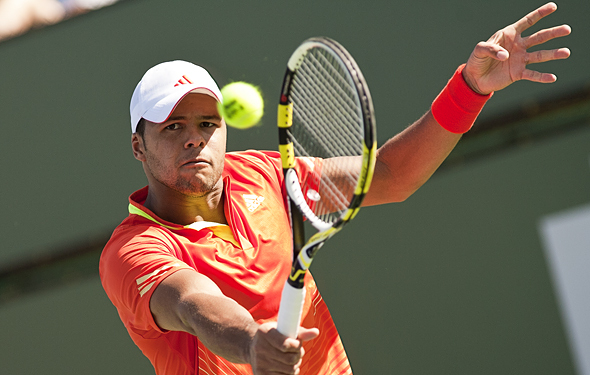 Do you think Jo-Wilfried Tsonga would have a better chance of winning a major? I sure do. On Sunday, Tsonga captured his 10th ATP title by fending off a match point against Tomas Berdych in a 3-6 7-6(6) 6-4 triumph in Marseille. Tsonga also saved five match points in his quarterfinal win over Bernard Tomic, many of them with winners, which clearly indicates clutch play. Tsonga has won five of his 10 career titles at home, including his sole Masters Series crown in Bercy back in 2008. Maybe home country advantage doesn’t mean that much in the grand scheme of things given that many players tend to perform better on surfaces and in conditions that are more to their liking, but recall that last year that Tsonga came reasonably close to taking out Novak Djokovic at Roland Garros, and clay is without question his worst surface. As an attacking player, Tsonga likes quick conditions and presumably Marseille was to his liking. Berdych is tough indoors too, and quite tough on Tsonga given that the Czech had beaten him the last three times they played.